What do you call a place that lets you indulge in a mug of beer and your favourite cafe food, whilst puffing on flavoured hookahs? No, this isn’t a description of what heaven feels like. However, if you’re looking for a hangout area to spend time with friends or go for a date, Attic, located on Lavelle Road, gives customers the opportunity to have a lavish time in the outdoors; revel in an exquisite al-fresco environment. The ambiance has a contemporary touch that falls right in the middle of a cafe and an open air diner. I can vouch for the backdrop to preserve the feel-good aura of this restaurant and give you something to reminiscence about. The food is a shade of vibrant, and there is a certain flair in the way that all the meals have been presented, making it a gastronomically satiating experience. They say half the appeal of the food is in the way it looks. Luckily for Attic, they are covered in both, the appearance as well as the taste department and the fare is a testimony to this attention to detail that is being invested into this space. After getting a good look of my surroundings, we decided to order Spicy Chicken Wings and Prawns Tikka. Very seldom do people go wrong with wings and Attic’s version is a proof of that fact. The Prawn Tikka was nothing but medium sized prawns, cooked in a tandoori style – a captivating classic as always! For the mains, we went with the Rostica Pizza and Chicken Steak Sizzler. The pizza was a visual treat and equally satisfying for my taste buds too! The Chicken Steak Sizzler was an absolute delight to savour. Finally, we ordered a Sizzling Brownie that was served on a similar sizzler platter as the chicken; basically, it’s a decadent brownie served with vanilla ice cream and topped with hot chocolate sauce. A blissful end to a wonderful meal indeed. Set against the rooftop background, complete with good food, a couple of beers and hookah, you’ll feel like you’re on a getaway when you visit Attic. Be sure to drop by if you’re stuck in a mundane work loop! 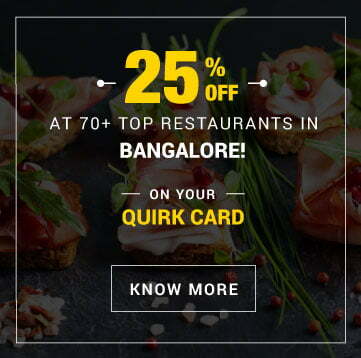 Buy the Bangalore Quirk Card! Sign up to get juicy articles on food, living, health + wellness, travel, in Bangalore and Bombay straight to your inbox!